The House Intelligence Committee on Tuesday afternoon is questioning U.S. spy chiefs about accusations that the National Security Agency has tapped not only the phone calls of millions of Americans, but those of top U.S. allies. Tuesday's hearing, billed as a discussion of potential changes to the Foreign Intelligence Surveillance Act, comes amid claims, reported last week by German magazine Der Spiegel, that the NSA monitored German Chancellor Angela Merkel's cell phone. It's the latest in a series of spying allegations that stem from disclosures given to news organizations by Edward Snowden, the former NSA contractor who describes himself as a whistle-blower. Comments by President Barack Obama's administration claiming that he did not know of the practice until recently have drawn criticism from both the right and the left. Saleem Smith has broken down this KB analysis into A range of Components, merely because He Joined for Factors Way too Numerous to Publish Right here. Solution to what snowden did and potential reason it happened too. One huge potential cause for snowden's actions , aside from the privacy issues, is he probably was not aware to what degree everyone does this, as most people aren't. It might be more reasonable to consider doing what snowden did only seeing at absolute best half the picture. Even assuming his position gave him 100% access to everything we do or did (doubtful) , it gives him absolutely no insight into what other countries do, or what we are up against. Every country that comes complaining about it, simply pull the files, prove they are doing it as well, publicly. This serves lots of purposes. It puts a cost to people jumping on the bandwagon and acting all upset when they are doing it too. It makes it a global problem not a US problem. All of this has so far focused on OUR agencies. Every country spies. We are in the unique position considering the data we have to put every single country that claims wrong doing on the same defensive we are. If the world wants to know secrets who is in a better position to tell secrets then us? I hope Snowden knows that he is spied upon by his temporary adoptive country, Russia, especially as he is letting out America's secret they are not letting him out of their sight.. if he was a Russian they would not let the US take him in and he would have been grabbed on the plane, Let him not think that he is so safe in Russia, not at all, they don't trust him, they will eventually send him back to the US. This boat is fast, it is designed to plane on the ocean. 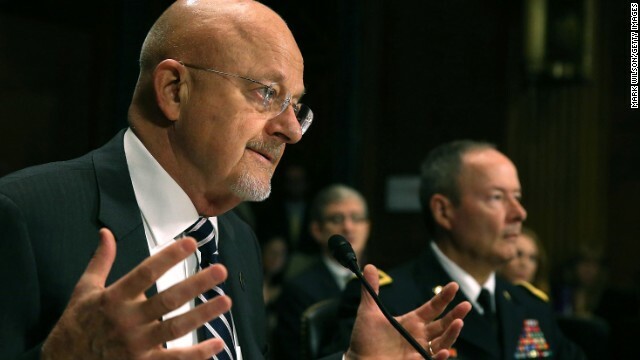 What would one expect this bozo James Clapper to say? Of course he's going to defend this spying on all of us by his agency! It's funny how this same agency never helps the FBI in the apprehension of notorious criminals on the loose!